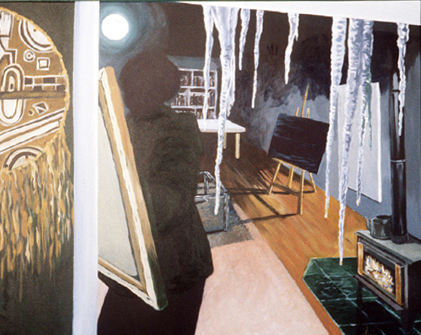 I painted this window reflection in the winter of 1999-2000 in Val-des-Monts, Quebec. The full moon shining on the Riviere de la Blanche remained visible, creating an unusual set of layers which also included the huge, beautiful but threatening icicles suspended from the roof, the glow of the wood burner, the Congolese Bateke mask hanging in the corner, the artist, easel and back of the canvas, the glass coffee table, Ikea bookshelves, the large painting entitled “Questions, Clouds and Conclusions” and a second easel on which the unfinished painting of Nukara stands. These three paintings are in Ottawa, ON, Charlottetown, PEI and Mill Bay, Vancouver Island.